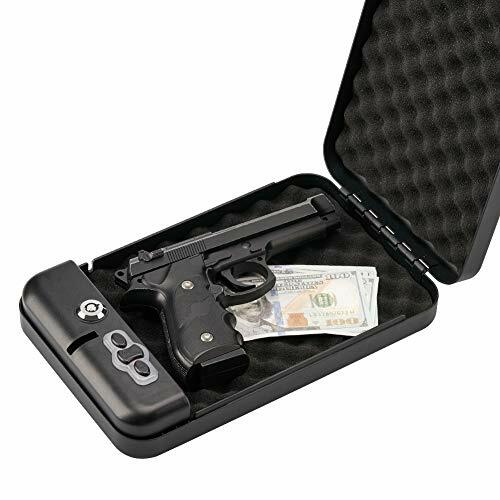 A compact personal safe great for compact handguns or anyone looking for a simple and secure on the go safe. The VAULTEK VE20 features the same quality and precision engineering you expect from a VAULTEK safe. STRONG 16-gauge steel body uses Vaultek's signature unibody design for strength and durability, and ANTI-PRY BARS obstruct tools from breaking in. LIGHTWEIGHT construction makes toting around backpacks and luggage a breeze. EASILY PORTABLE or ANCHORED. Secure your safe with pre-drilled mounting holes and included mounting hardware or on the fly using the 4 foot long STEEL SECURITY CABLE. Designed to safely protect loose valuables and provide on demand quick access when needed with the AUTO OPEN LID. SECURE ENTRY is made available through a 4-8 digit long passcode entered into the responsive keypad and SECURITY SLEEP MODE will time out for 4 minutes if curious fingers try and guess your code. 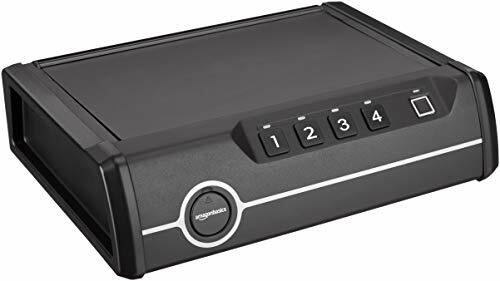 Built-in INTERIOR LED LIGHT provides excellent visibility of your items in the dark and the backlit LED numeric keypad illuminates via proximity sensor making it easy to navigate in low light environments. Several HOT KEY SHORTCUTS include toggling the sound on/off, checking battery status, and travel mode to conserve battery. The included long lasting RECHARGEABLE LITHIUM-ION battery keeps you powered for up to 4 months on a single charge, and only needs 2.5 hours to recharge using the included micro-USB cable. Makes a great gift for anyone looking to store handguns or keep personal belongings safely secured and out of the wrong hands. INCLUDED ACCESSORIES: (2) spare manual keys, micro-USB charging cable, rechargeable lithium-ion battery, and steel security cable. EXTERIOR DIMENSIONS: 11.5" wide X 9.0" deep X 2.75" tall. INTERIOR DIMENSIONS: 11.0" wide X 5.75" deep X 2.0" tall. U.S. PATENTS PENDING. COMPACT DESIGN is portable for travel in your car, the office, or backpacks and luggage and can securely hold 1 handgun and extra magazines. 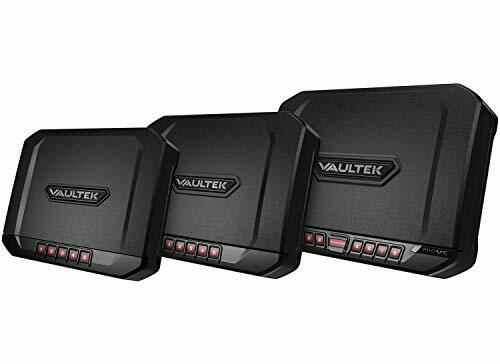 Brand: Vaultek | Manufacturer: Vaultek Safe, Inc. This safe is made of metal and plastic keypad. Not Hazmat. Batteries not included. FAST & DEPENDABLE 3 METHODS OF ENTRY: RFID activated by key fob that instantly opens the lid. Up to four RFID tags can be programmed. It is also accessible by 3-digit KEYPAD or conventional KEY LOCK. ANTI-THEFT PROTECTION & TAMPER PROOF: Featured on safes includes anti-impact latches and seamlessly welded pry-proof steel body for the ultimate prevention against break-ins and the unique hinge design holds the top lid open. TOUGH AND RUGGED: Heavy-duty 16-GAUGE carbon steel construction with a durable powdercoat finish prevents corrosion and ensures long lasting protection. MOBILE SECURITY: Included cable allows the safe to be secured in virtually any location. Meets TSA requirements for handgun safety in checked luggage. 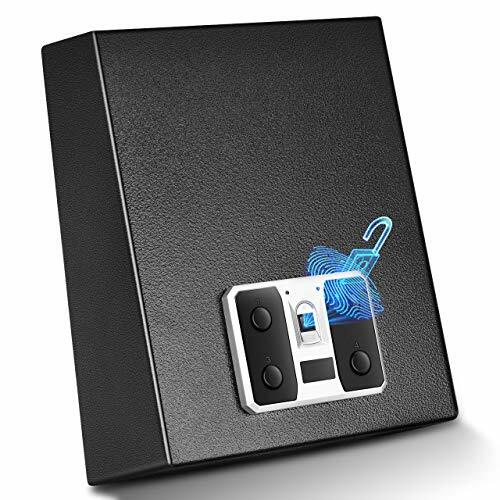 Compact Electronic Safe Box with Mechanical Override, Includes Keys Features: Heavy-Duty, Rugged & Reliable Safe Box Electronic Lock System with Mechanical Override Includes (2) Keys for Manual Safe Access Digital Touch Button Control Pad Customizable Password/Key Code Setting Reinforced Solid Steel Wall Construction Dual Security Steel Door Locking Bolts Corrosion & Stain-Resistant Powder Coat Finish Pre-Drilled Anchor Holes for Wall/Floor Mounting LED Low Battery Indicator Perfect for Home, Office or Business Use What s in the Box: Safe Box Mounting Bolts (2) Keys (4) x AA Batteries Technical Specs: Construction Material: Engineered Steel Alloy Steel Thickness: 3mm Door, 2mm Body Battery Operated Digital Panel: Requires 4 x AA Batteries Total Safe Dimensions (L x W x H): 12.2 x 7.8 x 7.8 The SereneLife Safe Box will keep your valuables secure & protected. Use the front panel digital button pad to easily control the electronic locking system. Enjoy hassle-free operation and quick access to your belongings after entering your customizable key code. The safe box also allows for manual access with (2) included keys. Additional features include rugged steel alloy construction, dual security steel door locking bolts, corrosion & stain-resistant powder coat finish, along with pre-drilled anchor holes for permanent mounting in a convenient location. Store your valuables and keep them protected with the SereneLife Electronic Safe Box. With a completely revolutionary design, the Stealth Tactical Handgun Hanger Safe allows you to have your choice of three handguns at the ready and an additional two handguns in the bottom storage for back-up. You can arm a family of 5 in seconds with this safe's max capacity of 5 handguns. Inspired by tactical enthusiasts desire for handguns at the ready, there is nothing faster than a drop down door and your choice of 3 "hanging" handguns to choose from. When speed and your family's protection is the most important factor, there is no better option than the Stealth Handgun Hanger Safe. The quick access Electronic Keypad stores your choice of a 6 digit combination and illuminates with a blue light after the first button is activated. With audible feedback, you'll know the button has been pushed and after the correct combination is completed, the spring loaded door flips down to present your pistols. A red interior light turns on immediately after the door drops down allowing you to easily see inside your safe even in the dark. With all solid steel construction, a thick steel door and the battery located on the inside, this safe is insanely difficult to tamper with and extremely pry-resistant, preventing unauthorized access and leaving you feeling confident that your children will not be able to access your handguns. The Stealth Handgun Hanger safe runs off of one 9-volt battery located on the inside and has a backup high security tubular key override. Located on the bottom of the safe are 4 bolt down holes and a free security cable is included to ensure a thief is unable to just pick up the safe and open it on their own time. In the back of the safe is an interior shelf capable of storing an additional 1 large clip or 2 small clips. The safe is completely lined with high density foam on all sides to ensure no scratches on your most prized handguns. Stealth believes in and stands behind the Handgun Hanger Safe by offering a one year warranty. ADVANCED BIOLOGICAL FINGERPRINT IDENTIFICATION TECHNOLOGY. QUITE EASY TO INSTALL AND CARRY. 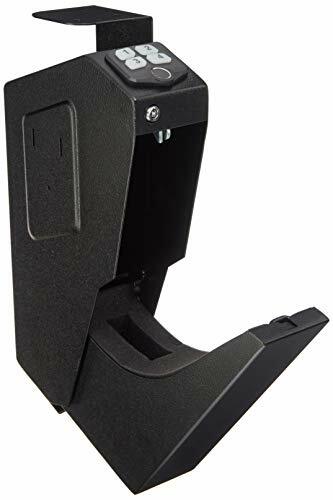 The portable handgun safe goes with all the hardware you need to install (excluding batteries), and there are holes on the bottom of the safe, these will help you install it on the wall, or either side of your bed or your desk depending on your choice for quick access. The size of the firearm storage is (L x W x H: 11" x 7.8" x 3"), and 9.7LB in weight. Namely, it is quite easy for you to put it on your bedside table or carry it on your car everywhere. Pre-drilled mounting holes, suitable for mounting on the wall. External width (in. ): 12" x 9" x 5.3"
Internal width (in. ): 11" x 7.8" x 3"
This pistol safe is a MUST BUY, offering you all the comforts you could ever want from this perfect and very convenient device! We are confident that this portable pistol safe will quickly become the most reliable addition ! ADD IT TO CART NOW! 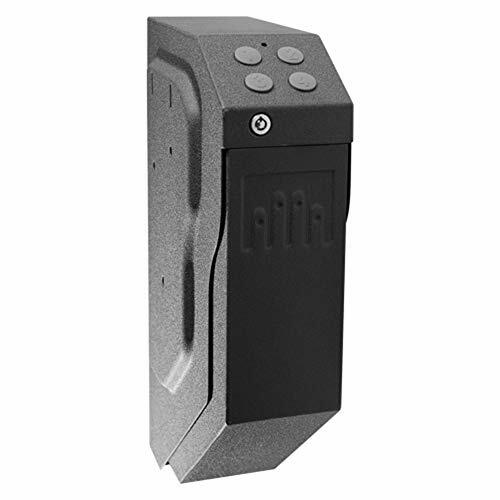 Advanced Biological Fingerprint Identification Technology & Decent Capacity YUEMA gun safe, has employed the most sophisticated biometric sensor chip, which can collect about 25600 fingerprint points for each fingerprint. 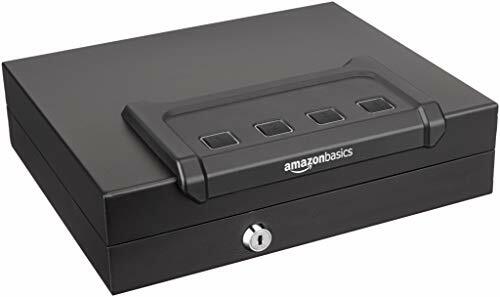 What's more, achieving greater security compared to a keypad, this 1.8 cubic feet handgun safe can save up to 30 unique fingerprints for multiple people and is ideal for organizing your handguns, jewelry, cash, small electronics& important documents. Leading-edge Fingerprint & Electronic Lock Provides Easy Access and Quick Entry Adopting newest fingerprint lock and auto-open door, the biometric gun safe creates an easy and secure opening system that is coupled with a red and green light pattern, to achieve an excellent match speed of less than 1 second. Besides, the electronic password of the pistol safe offers quick entry for your belongings. It is easy access to open depending your choice, fingerprint mode or electronic mode. Solid Steel Construction & Scratch Resistant Finish Ensures Durable Use Made of heavy duty tough cold-rolled steel material, our gun case comes with scratch resistant finish for preventing corrosion and ensuring long lasting protection of your belongings for years to come. YUEMA gun box is also attached with a foam-padded interior for maximum protection and the plush interior upholstery helps protect your guns from damage. 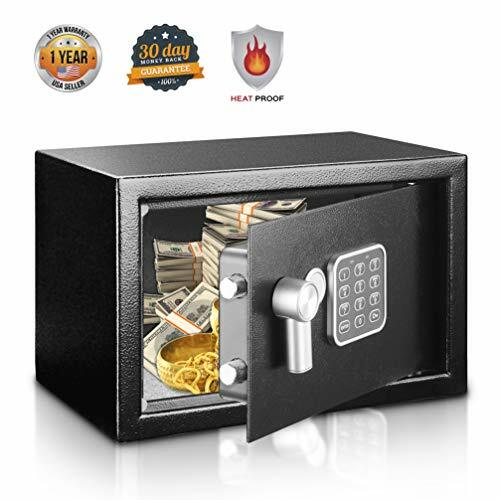 Upgraded Double-open Design Safely Protects Your Valuables and Belongings With cutting-edge fingerprint technology and reliable electronic lock, this handgun safe ensures 100% safety for your valuables. 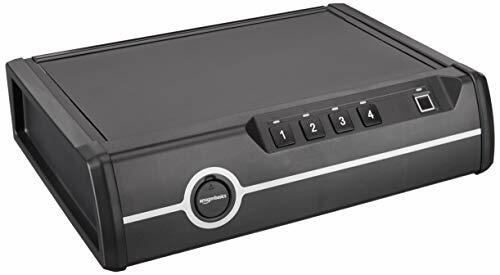 Featuring a low battery warning system & Mute Mode, the biometric safe is ideal for any office or home to store your valuables, such as guns, money or jewelry Equipped with two unique override keys, the pistol safe offers backup entry and adds advanced protection for your home defense needs. 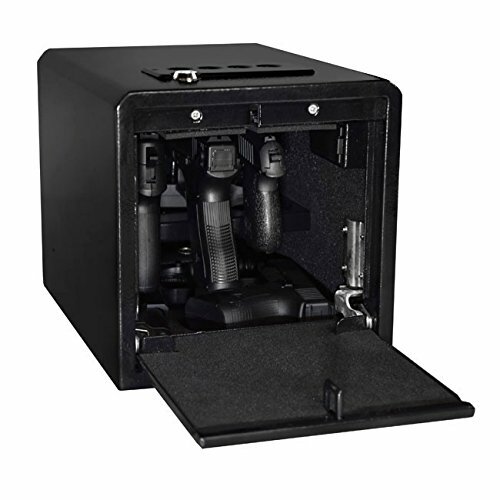 Portable Compact Size & Wall Mounted & 5 Years Reliable Warranty The gun safes include pre-drilled mounting holes and hardware for floor and wall mounting. Exterior Dimensions: 14.9 x 11.6 x 8.6. Internal: 12 x 9 x 5.3. Weight: 13.2 lbs. The compact size makes it suitable for around the house or in a vehicle. We offer a 5-YEAR FREE REPLACEMENT OR MONENY BACK GUARANTEE if you are not satisfied, totally no risk for you!